Sometimes, I had a rough sleepless night and I wake up feeling like a zombie.. zzz~ I really hate it when I wake up in this condition. I wake up feeling lethargic, mentally weak but I had a whole lot of task waiting to be completed. =/ This is also when I feel hungry but eating seems to consume so much time! HISHOP sent me my saviour just in time! Let's see if this FINE Diet Coffee can help me! When I received the parcel, I get attracted to the packaging instantly! It's a solid metal can and that includes the cover as well. It gives a perception of good value, don't you think? 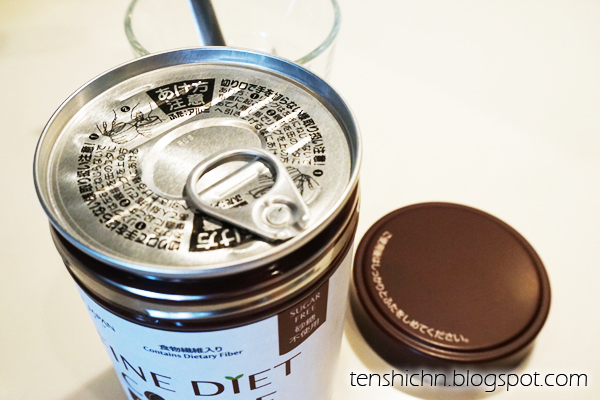 Twist open the cover and there's a pull-open lid which conceals the ingredients stored inside. A very hygienic way to seal the ingredients from contamination before use and total ease to remove it! 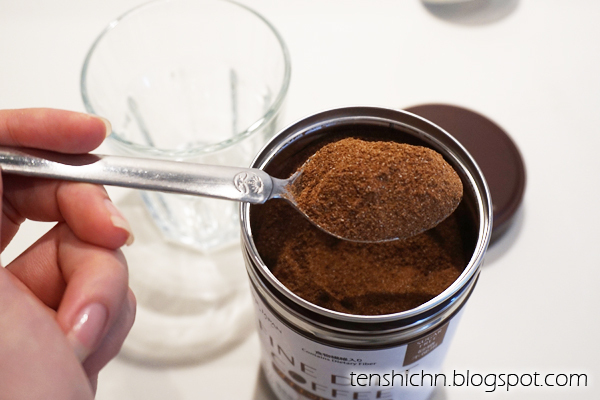 The powder does not have a strong aroma like most coffee powder or beans when you open them up. It could be due to the light roast. Dark roast always give a strong aroma. I'm fine with that. When it comes to dietary products, I am more aware of the ingredients and also the place of origin and manufacturer. 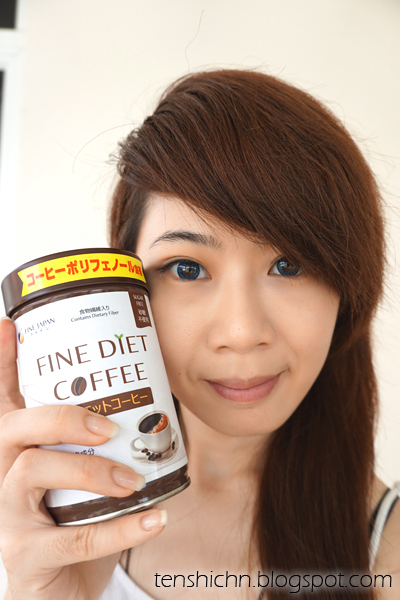 FINE Diet Coffee is a Japanese product and it gave me more faith in the safety and quality of their products. The powders are grinned really fine and light, a mixture of Green Coffee Bean - higher antioxidant but less acidic / Garcinia Cambogia - natural appetite surpressant / Dietary fibre - made from corn to supplement dietary fiber insufficiency. I added two teaspoons of powder and about 200ml of hot water rather than the suggested 100ml~120ml water. 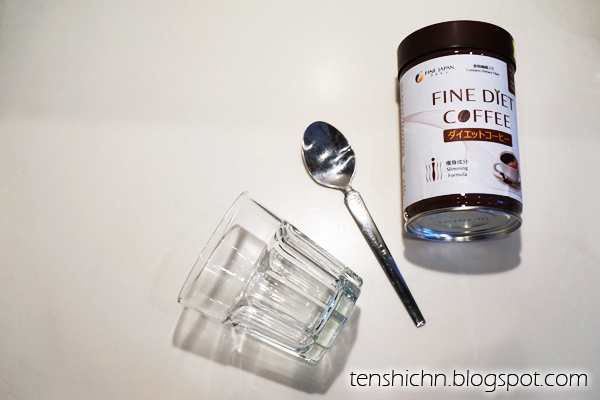 Usually, it is easy to taste a diluted coffee if too much water is added. 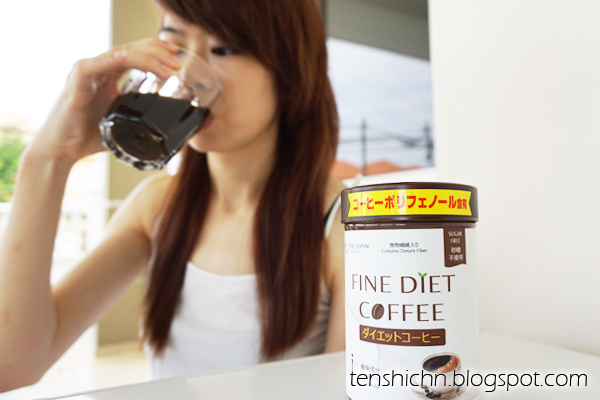 Surprisingly for my mixture, the taste was not like bland diluted cup of coffee. It taste light and pleasant. I suppose it is the light roasting which differentiates it from the usual cup of diluted bitter dark roast taste. Again, there was no strong coffee aroma but I'm good with that too. There was no sugar added and for the first time, I actually like the taste of sugarless coffee without milk! No difficulty in drinking at all! I like how it helps to suppress appetite and increase my mental alertness so that I can quickly get my task done on time! Not worried about feeling like a hungry zombie with tons of task waiting to be done anymore! You can easily purchase this product online from Hishop website through the link below! 175: Parking Rate around Bukit Bintang! 151: Moist, Diane. Non-Silicone but Silky Smooth. 161: Bath & Body Works now in Malaysia! 076: Arissto Premium Coffee Machine! 188: Getting Creative with 7PolkaDots! 187: A Date with Casio EX-ZR3500! 183: Kindersoaps - Natural Handmade Soaps!